I saw some adorable teacup planters at Walmart last summer, big ones for $19.99 and small ones for $15.99. They were so darn cute that after 3 visits I forked out $19.99 (which I think is way expensive for a planter this size) to bring home this beauty. Again, pre-blog pic taken during a freak snow storm in early October. Everyone one that came home raved about the teacup planter. All summer long we enjoyed it on our table on the deck. Then we had the Snowtober aka snow in October (the above pic). I should have taken that as a warning to bring my planter inside, but didn’t. It sat in the same spot till…….early December when one day we woke up to a shattered mess on the deck. The poor thing had succumbed to the cold. As expected B was all in the “I told you so” and I was in the “I know, totally my fault” mode. In an attempt to save face and to at least make the most of my $19.99 I said, “I’ll fix it, I don’t know how but I’ll try” and brought the planter inside. It sat there moving from our family room to our breakfast area all through winter. Then about 3 weeks ago I got another warning signal, this time a bit more serious. While running around the house my son slipped and fell on the planter cutting his wrist on the broken sharp edge. Luckily the wound wasn’t that bad as it was a few centimeters above the critical wrist area. That was it for me, no more dilly dallying on this project. As it was an attempt to salvage whatever was left of the planter (actually quite a bit) I didn’t want to spend more money on it. So I used super glue to stick the large pieces back. You need to empty out the container, clean it with soap, and let it dry first. At least I was able to cover up the holes. Now….on to covering up the mess. I had two rolls of poly cord which could work as it wouldn’t rot outside. Enter the handy glue gun. My first major hot gluing project ended up in quite a few burns. Still……things started to look better. The handle was a little bit tricky and needed a lot of patience. Just as I was wrapping it up, I ran out of poly cord. After a trip to Home Depot for another roll I finished covering the whole thing. Kinda neat, huh? You don’t need to worry about being exact, just make sure that there are no large gaps. On the top you can go over the whole thing with one more round of cord to cover up any irregular seams. Had I used just one color cord (how I wish, especially that orange one) I would have stopped at this stage. As I had used different colored cords and that too without any pattern I decided that painting the whole thing would make it look better. I had left over black paint from the planter rescue project from last week. There is nothing a can of paint can’t do, right? Not really…I ended up with this mess! May be it was because of the color, black? All the extra glue, every flaw, and every uneven turn was magnified. Luckily I had bought a can of Rustoleum Fire Orange spray paint the last time I went to Home Depot, just as a back up. Time to take that one out. I was kinda liking the rustic look, so decided to keep it that way. A few begonias and a coleus later we were back in action after a five month hiatus. Not bad…huh? For something that was headed straight to the trash? By the way, you could still see the broken joints on the plate, so I just drew a vine design all over with a permanent marker. Have you had to deal with such crisis control situations? What was wrong with the different colored version!? I like this end version too…but that was super cute! Thanks Vidhya. My daughter asked the same question too. 🙂 Was not really feeling the pink and green, would have stuck out like a sore thumb with rest of the decor in the house. If I had known that HD had that orange (it is actually coral) cord I would have just gone with that one all the way through and not painted it at all. 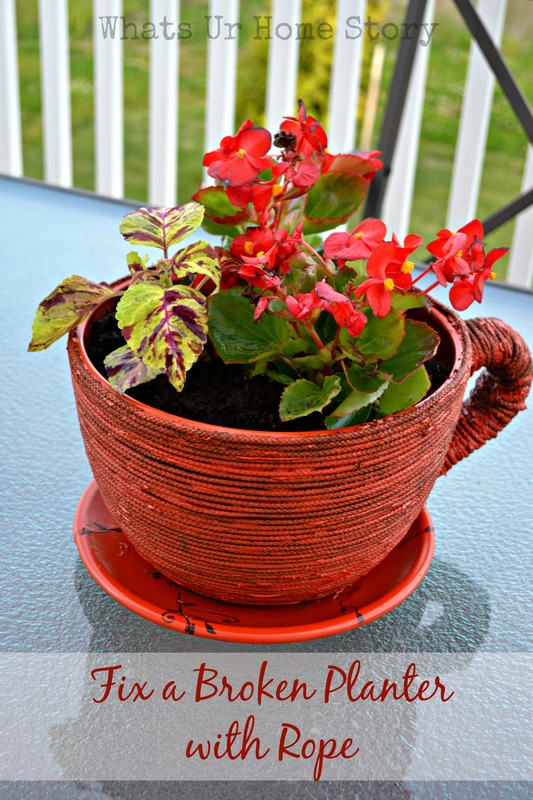 LOved what you did with the tea cup planter. I had seen a similar one at Walmart with polka dots, but did not feel that it went with the predominantly Indian decor in my home. The earth tones that you had used give it a very distinctive look. Thanks Anu. B said he saw the same one at our local Walmart y’day. That one was more earthier looking than the polka dots one. Thanks so much. Really appreciate the support. I’m in awe and the same time am humbled by the support YHL fans have shown me.